Last January the Alloy Yachts shipyard launched the latest in a series of super-yachts commissioned by Neville Crichton, whose relationship with the New Zealand shipyard goes back a long way. The design, which we were able to present in our pages, was called 'Harlequin'. The boat was subsequently sold and renamed 'Destination Fox Harb'r' by its new owner. Now that the boat has been launched we can present it in detail, offering our readers the chance to appreciate the stylistic and technological features of the design. This is a 134 foot sloop designed by Dubois Naval Architects whose aim was clearly to produce a performing boat which at the same time was comfortable and luxurious. Manoeuvring propellers: 2x90 HP, one astern and the other at the bow. 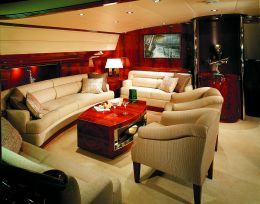 For further information contact: Alloy Yachts International; 1 Selwood Road, Henderson; Auclkand; Nuova Zelanda; P.O. Boxd 21480, Henderson; tel. 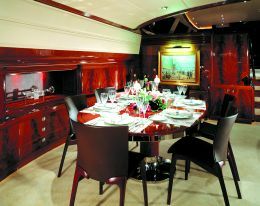 09 838 7350; fax 09 838 7393; web site www.alloyyachts.co.nz; e mail mailbox@alloyyachts.co.nz. This latter quality is clearly visible in the interior, designed by Redman Whitely Dixon. 'Destination Fox Harb'r' was built under contract at the Alloy Yachts International shipyard in Auckland, New Zealand and it is the seventh super-yacht built by the shipyard for Neville Crichton, previous ones being 'Chanel, 'Esprit', 'Espadà, 'Corinthian'. 'Sovereign' and 'Kokomò. The latter was launched in 2000 and used as a model for 'Destination Fox Harb'r' as regards the relationship between hull length and maximum width, since it is this which determines the comfort and space of the interior. 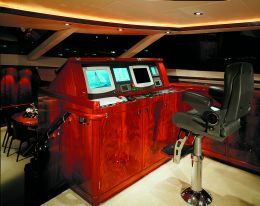 Inside, everything is entirely in mahogany with fine rugs everywhere, including in the control station. 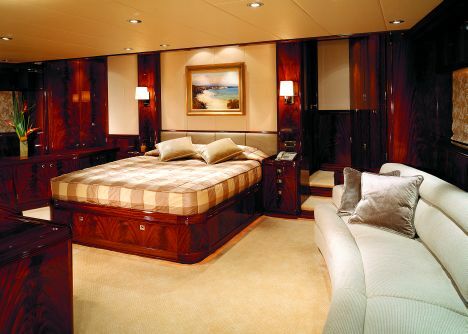 The designer in charge of the layout below deck had the needs of the future owner in mind and created a suite with double bed, with office area and small sitting room, positioned astern in the night area and occupying the entire width of the hull. From the access area to the owner's cabin you reach another two spacious cabins with double bed and yet another with bunk beds, all extremely comfortable and with en suite bathrooms. From this area you ascend the stair to the spacious bridge house which contains the saloon, the dining area and bar, all on the upper deck which also houses the covered control station with the manoeuvring controls and an area for communication and navigation. 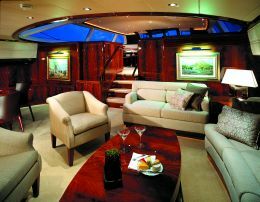 Back below deck, there is a full-width saloon positioned in the centre of the boat with a spacious dining area seating ten and a lounge area with sofas and numerous leisure accessories. Towards the bow are the sleeping quarters and bathrooms for skipper and crew. The designer Ed. Dubous notes that the water lines and the arrangement of the immersed tailpieces and weights are based on the concept already utilised for the 'Kokomò. The keel has been lengthened to increase the righting moment and the yacht's jamming capacity. "Destination Fox Harb'r" was present in the final rounds of the Americàs Cup and also took part in the second NZ Millennium Cup, the regatta reserved for super-yachts which took place in February. 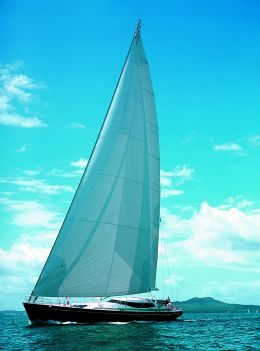 Naturally the sail plan and the deck apparatus fulfil the design objectives. The rig, mast and boom are in carbon fibre from Southern Spars, spanker and spinnaker have a total surface of 874sqm and were made by Doyle Sails Auckland. 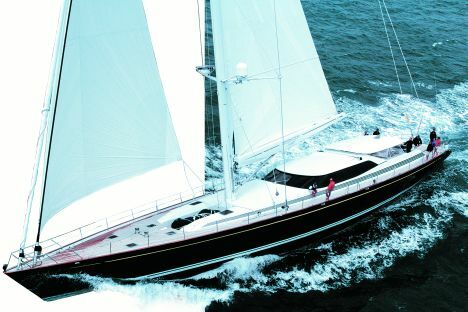 The mast has five orders of cross trees, on the deck there are six winches produced by Nilsson Winches and six Lewmar drum self tailing winches. Motorization comprises an 800 HP Caterpillar coupled with a ZF 1960 reducer with reduction ratio of 3.7:1 and variable pitch propeller. Motorised performance achieves a cruising speed of 10 knots and a maximum speed of 12.2 with a range of 2,800 miles. This is a performing yacht but it has also been designed for long cruises and on board there are a number of safety systems such as the Alloy Yachts Custom Touch Screen Alarm, which monitors all on-board systems, displaying any problems on three different screens. In addition, all areas are equipped with a smoke or fire alarm. 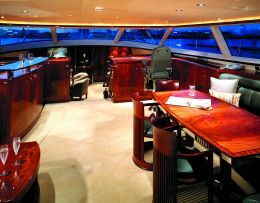 The tender, a 5.3m RIB made by Italian Novamarine, has built-in housing on the deck forward of the bridge house. On board there is special diving apparatus including a Bauer Junior II recharging station. Details such as the deck entirely lined in 60mm teak, the blue hull and the sleek line make this yacht by Alloy Yachts International extremely attractive and the technology on board adds to its performance and safety.